Lucky Dog Stamper: Happy Father's Day! 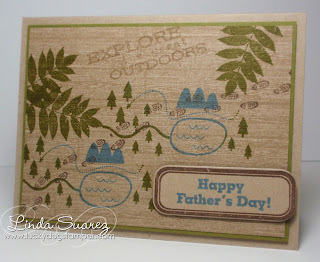 A quick post today with the Father's Day card that I made for my husband. We both like to hike with our dog so I thought I would use the new Summer Camp stamp set from Papertrey Ink to create a scene. I think he'll like it. My card was inspired by this card by Heather Nichols and found on her blog here. Thanks for stopping by! Have a great Father's Day! This looks like a perfect card for a hiker! I'm sure he loved it! What a perfect Father's Day card Linda!! I love the colors you used! Just lovely! !